Designer breaks record for longest wedding dress train on the catwalk | HELLO! 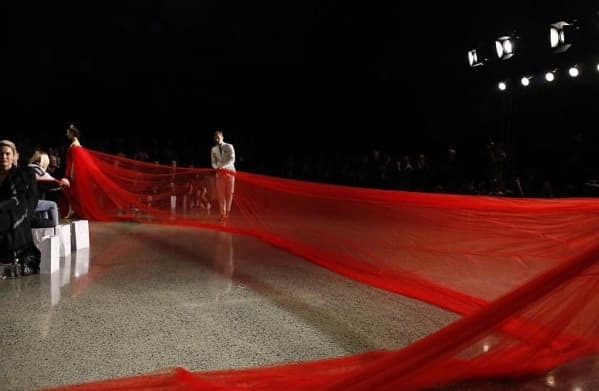 Bridal designer Trish Peng ensured her show at New Zealand Fashion Week was one to remember by creating a gown with a train that spanned over 20-metres in length. The striking wedding dress broke a record for the longest train on the catwalk – and even needed its own team of staff. Fashion insiders were left speechless by the dress, which served as the finale at the NZ Weddings Magazine show at Auckland's Viaduct Events Show on Thursday. The seemingly never-ending train flowed behind the model as she sashayed elegantly down the runway, with members of staff on hand to ensure it didn't stray off course. Sharing a photo of the dress on the catwalk on Instagram, Trish wrote: "When your train is so long it needs its own minders." 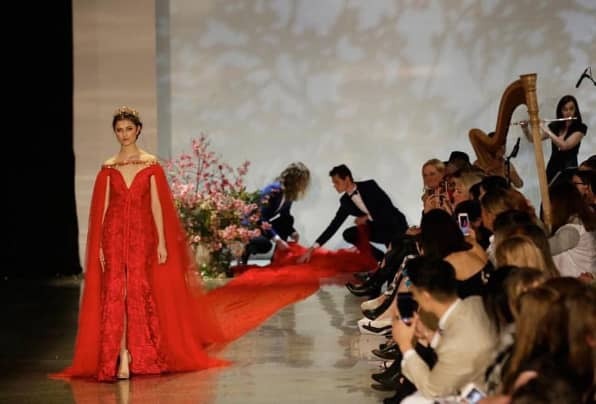 The proud designer also posted another image of the show stopping gown on social media, telling fans it was "The longest train to ever hit a NZ catwalk. Over 20 metres long." It wasn't only the record-breaking train that got people talking, but the bold red hue too. The designer said she chose the vibrant shade because it "is a sign of prosperity and good luck so it's a bit of that as well as making a statement for the grand finale piece." A spokeswoman for Trish Peng told Daily Mail Australia that the dress was created using vintage Christian Dior lace flown in from France, which was embellished with hundreds of Swarovski crystals and finished with the impressive red silk tulle train. It took four people 120 hours to complete the gown, which was accessorised with a gold wreath style headpiece and matching shoulder clasp to secure the record-breaking train. What do you think of the Trish Peng gown?